Mango is an amazing fruit that is not only delicious but its full with health benefits. When you savor the sweetness of mangoes, you don’t think about the abundance of vitamins, minerals, and antioxidants it contains. 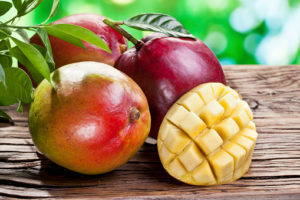 This is no surprise mangoes nickname is “the king of fruits”. Health benefits of mangoes are amazing you won’t expect it. But first, where do mangoes come from? Mangoes were first cultivated in Eastern Asia and Easter Africa. They were finally introduced into our beautiful state, California, in 1880. Today, you can enjoy a savory mango right on Pacific Coast Highway. At PC Greens, we offer high-quality, exquisite mangoes. 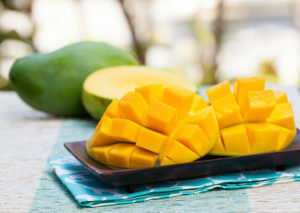 According to its original beliefs, mango is a symbol for life. We believe this is 100% true and you’ll see why. Health benefits of mangoes clearly demonstrate how they are life and will give you life. One of the biggest health benefits of mangoes is the impressive vitamin content. They contain high amounts of potassium and magnesium, which are great natural remedies for high blood pressure. Mangoes play a vital role in eliminating stomach problems such as indigestion and acidity. Health benefits of mangoes such as the digestive enzymes help improve the function of the digestive system. This boosts your metabolism and body system overall. Anemia is a common problem among people and many are not fully aware of it. The richness of iron and minerals, are amazing health benefits of mangoes. They are super beneficial for people suffering from anemia. Health benefits of mangoes increase the red blood cells, helping eliminate this problem. Other health benefits of mangoes include healthy looking skin and lightening skin. Mangoes are great at clearing pores and eliminating pimples from your skin. Unclogging pores is the best way to eliminate acne and have a young, healthy looking skin. Excellent health benefits of mangoes include the abundance of vitamin B6. This is vital for painting and improving the function of your brain. Vitamin B6 should be part of your diet everyday. By incorporating mangoes into your daily consumption, you will have a healthy brain and effective nerve functioning. Health benefits of mangoes enhance the immune system of your body. Its richness antioxidants then transform into Vitamin A. Vitamin A gives you an extra protection in your body against illnesses. 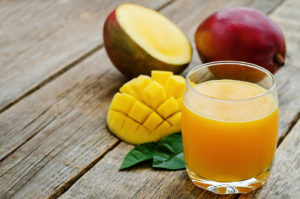 Health benefits of mangoes are exactly what your body needs this summer! Available year-round, you can incorporate them into your diet. They’re sweet, juicy, and extremely delicious. Come to PC Greens in Malibu and buy mangoes!